Plants are static one and cannot show movements as like animal do. Although plants are static, plants can show some kind of movements in response to certain environmental stimulus. Those movements can be categorized as movements towards the direction of stimulus and movements which are not directional. Responses belonging to first category are phototropic movement (movement of plants in a direction to light stimulus), thigmotropic movement (movement in direction of touch) and gravitropic movements (movement towards gravitational force). Responses belonging to the second category are nastic movements (also referred as sleep movements) which are no directional and are naturally associated with plants. Charles Darwin is well known for his contributions to evolutionary theory. But most of the people are unaware of his pioneering work in the discovery of plant hormones. Darwin and his son Francis were interested to know phenomenon governing the movement of plants in direction to the unilateral source of illumination. They carried out experiment in which they used coleoptile of canary grass and illuminated one side of coleoptile with source of blue light. In observation they got is bending of coleoptile towards the source of light. After their work many scientist used several approaches to discover the chemical compound which is actually responsible for bending movement. Later on it was discovered as plant hormone auxin which is involved in tropic responses. The principal auxin in higher plants is IAA (Indole-3-acetic acid).IAA can be synthesized in tryptophan dependent or tryptophan independent pathway. Auxin is the only hormone which shows the polar transport. Auxin is synthesized at shoot apical meristem and transported in downward direction. PIN proteins are responsible for polar transport in plants. Auxin can be transported in two ways depending upon its charge. Uncharged IAA can easily diffuse through lipid bilayer. But charged IAA can enter inside the plant only through secondary active transport mediated by AUX1 (auxin influx protein). Nature of auxin depends upon the cell wall pH. Cell wall pH is generally maintained acidic because of H+ ATPase and it is near to 5.The pKa value of Auxin is 4.75, so whenever it is present in cell wall region half of the molecule are present in dissociated form (IAA-) and half will remain at undissociated form (IAA) (molecule at pH below its pKa value will be protonated while molecule at pH above its pKa value will be deprotonated). Auxin can enter inside the cell from any direction. Once it enters inside the cell, it becomes charged (IAA-) as the pH inside the cell is near about 7. The only way for auxin to exit cell is through PIN protein. PIN proteins are Auxin efflux protein and located at basal side of cell. These membrane proteins are responsible for polar movement of Auxin within plants. When plant is eliminated with unidirectional source of light, relocalization of PIN protein occurs on the lateral side of the cell membrane allowing lateral movement of Auxin. 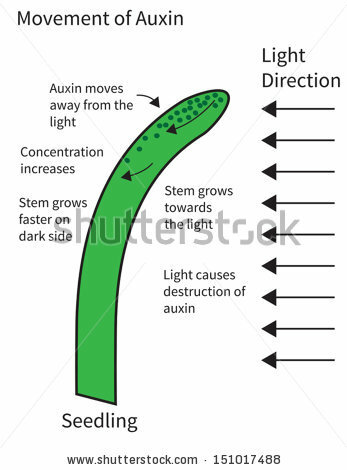 Hence auxin concentration increases towards the shaded side of the plant as compare to the illuminated side. The increased concentration of auxin leads to differential growth of cell towards illuminated side. Differential growth of cell is because of cell enlargement (acid growth hypothesis). This differential growth leads to bending of the plants towards the light.